Life is busy. Life is complicated. Ultimate To-Do List helps you organize your life so you can focus on what's most important in the here and now. Simple, but powerful. Whether you need a basic to-do list, need to manage complex projects, or fall somewhere in-between, the app can be set up to meet your exact needs. Turn on the features you need. Turn off those you don't. Organize your to-do list any way you like. You - not the app - decide what's most important. Use a task management system such as Getting Things Done (GTD) or Master Your Now (MYN), or set up your own system. Stop forgetting things. Highly customizable lists and reminders ensure you won't miss anything important. If you want, the app can even nag you repeatedly until you get the task done. Record and review your tasks hands-free. Use the app's voice mode to create, update, and read tasks while you're in the car, wearing gloves, or changing a diaper. Keep track of important information that is not a to-do item. The app's notes area lets you record reference information that you know you will need later on. Make the most of your large-screen device. Several split-screen options are available to handle larger smartphones, 12 inch tablets, and all sizes in-between. With Ultimate To-Do List, you can access your tasks from a wide range of devices, including Android smartphones and tablets, Kindle Fire tablets, and desktop or laptop computers. 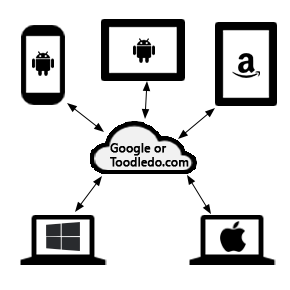 All devices use your Google or Toodledo.com account to stay in sync. Learn more.